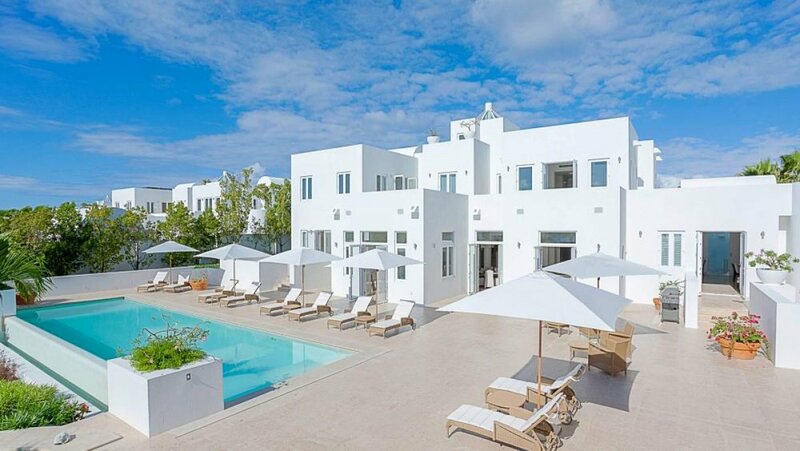 Located on a private cove with a sandy beach, Arushi Villa is one of Anguilla’s premier villas. With over 5,300 square feet of living space, this home has plenty of room and privacy for you and your family or friends. There are 5 master bedroom suites, all with ensuite bathrooms and exterior access. Outside, you will find tons of lounging and dining space on the expansive terrace. Enjoy your meals with a view, swim in the pool, or relax in the Jacuzzi. Just a few steps will put you on your own semi-private stretch of beach where you can swim and snorkel. Sits directly on Rendezvous Beach! Arushi Villa is situated in a gated community on the western end of Rendezvous Bay. This beachfront vacation rental offers modern Caribbean luxury amidst relaxing indoor/outdoor spaces. Sparkling white sands and turquoise waters are a few yards from the back door. Bougainvillea, palm trees, and manicured greenery add privacy and ambience to the terraces, pools, and paved pathways. By the sea, there’s a hammock and a lounging pavilion. The hot tub’s location between the beach and the main terrace balances privacy and convenience. The main terrace holds several loungers, umbrellas, and dining nooks, as well as an L-shaped infinity pool. There’s also an oceanfront observation deck, a dining pavilion, and an entry courtyard with a water feature and lush bougainvillea. For golf lovers, Anguilla’s 18-hole Gregg Norman golf course is just steps away. Arushi Villa offers central air-conditioning and five elegantly appointed master suites with marble bathrooms. Butler and concierge services are included in one simple rate. The kitchen, living room, dining room, sitting room, and office occupy 5,300 square feet on two levels. The sitting room introduces the interior to the exterior with cozy furnishings in chic neutrals. In the living room, guests can settle into the plush sofa and watch movies on the flatscreen TV and entertainment system. Behind the sofa, there’s a dining table that seats 8. A pass-through window acts as a breakfast bar between the dining table and kitchen, which features luxurious cabinetry, stainless steel appliances, and access to the dining pavilion. Four of the suites have king beds, and one has two queens. All five have an ensuite bathroom with an outdoor shower. On the ground floor, there are three suites that each have a walk-in closet, seating, and access to a private terrace. Upstairs, both suites have their own foyer, walk-in closet, and access to the shared balcony. An office sits between these two suites. One bedroom can be reached by an exterior staircase, and both have interior access as well. WiFi is available throughout the home and pool deck. Rendezvous Bay is home to several restaurants, activities, and water sports. Blowing Point is just to the east, so guests can easily get to the ferry and explore the surrounding islands. Guests will be met at the airport or ferry dock and escorted to the villa for an orientation of the property. Your rental car will be delivered to the villa. Continental breakfast is included over Christmas/New Year's weeks. There is a US $3.00 per person per night government marketing levy. Car rental, private chef, grocery and beverage shopping (pre-arrival and during your stay), liquor and wine delivery, nanny service, baby equipment, spa services, yoga and personal training, photography, and private transfer/car service can be arranged for an additional fee.